HIGH NET WORTH FORUM IS CPD APPROVED! Insurance Age's High Net Worth Forum is the only event aimed at high and ultra-high net worth brokers in the UK who want to be one step ahead of the game. Bringing together around 150 delegates from across the country, the event will offer unparalleled networking, ideas sharing and a forum for meaningful insight. What do you buy the high net worth individual who has everything? 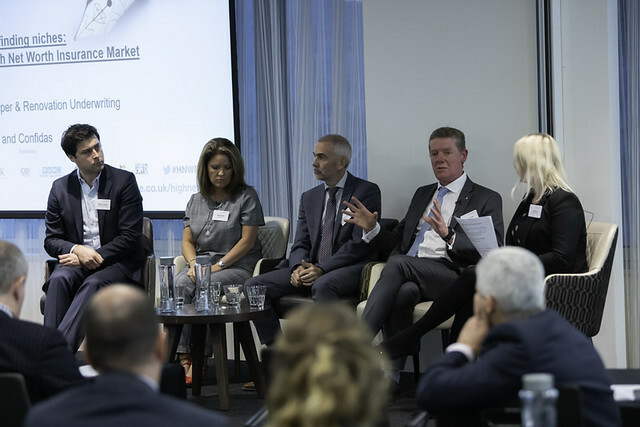 At the recent Insurance Age High Net Worth Forum, ARAG’s Andy Talbot explained why legal expenses insurance tailored to suit the heightened and varied demands of the high net worth market is essential, to ensure such clients are fully covered. Excellent event with valuable content throughout. Sam Cowen - Director, 3sixty Insure Ltd. Interesting and Motivational, makes you realise that this is a good industry to be working in. Well run with excellent presenters covering relevant topics. Emma Patrick - Private Client Manager, Riskworks Business Services Ltd. Excellent event, with high calibre speakers, giving a real insight into the HNW market. John is a highly recognised and prominent figure in the specialist home insurance market that exists in the UK. For more than 25 years he has held notable senior positions with two of the main specialist insurers. In 1996 he led the launch in the UK of the world’s most respected insurer of the affluent, Chubb Insurance and its Masterpiece product. Masterpiece changed the face of insurance in the UK and remains one of the best insurers for this highly specialised sector of the market. John ran the business for eleven years. John also ran AIG Private Clients in the UK and has provided wide ranging consultancy services to some of the most respected companies in the market including Covea, DAS, Ecclesiastical, Hyperion, Lawshield, Lockton International, MS Amlin and the government backed terrorism reinsurer, Pool Re. Prior to moving to the underwriting side of the business John was a well respected insurance broker and his main client base was affluent families and their insurance needs. John has always had a passion for service, especially the claims side which is the single most important area for any client. John created Vizion with his partners to deliver world class service having seen how good and bad service can be at other brokers throughout his long career. James is a director and equity partner of Stackhouse Poland and heads up Stackhouse Poland Private Office. James is also a Chartered Insurance Practitioner and has advised the very wealthy in respect of their personal insurance requirements for over 20 years. He takes a very hands-on approach for the benefit of clients and is passionate about "doing the right thing" for clients and providing the very highest levels of service. Dislikes: Poor service, Lateness, day time TV. With 30 years experience at Lark, now Aston Lark, Dave Foster heads up the Private Client Division, and has been a Board Director for the past 10 years. For most of his career, Dave has been hands on with HNW and ultra HNW clients and as well as running the business concentrates on attracting and developing new business. Dave is extremely proud of the fact that his business won the Insurance Age Private Client Broker of the year for an unprecedented three years running between 2013-16. After that he felt it was time to give someone else a chance! Rachel is a Partner at Lockton Companies LLP and leads the Private Client practice. As well as leading the team, Rachel works with ultra high net worth individuals, their advisors and family offices. She supports them in assessing physical assets and liabilities, and designing, implementing and placing insurance programmes; protecting and preserving clients’ wealth and lifestyles. She draws on solid cross-class insurance knowledge to advise on risks of all types – from property, estates, motor, art, jewellery, aviation and marine etc. Rachel has over 25 years’ experience in the insurance industry, the last 20 focused on private clients and previously as an underwriter of commercial insurances and estates. Rachel’s leadership, market relationships and thinking beyond the obvious, provides clients with positive results and her team with a great place to work and career opportunities in this specialist area. Working for One Broker as a Business Development Manager, Adele Rand has a notable background in the high net worth insurance sector, drawing on over 2 decades in the insurance market. Adele prides herself on her ability to understand the needs of these clients and the complex risks this sector presents. Prior to joining East Anglian based One Broker, Adele has worked at Director level within the insurance broking sector. She enjoys face to face networking and outside of work, Adele enjoys swimming, listening to music and watching musical theatre. An FCII qualified insurance professional whose career initially embraced underwriting with the Royal Insurance Group before transferring to a number of roles in broking. In a career spanning over 40 years Marcus has, for the past 15 years, concentrated on high and ultra-high net worth private client business as well as landed estates and rural risks. Having run the private client businesses at both HSBC Insurance Brokers and Marsh, latterly, Marcus has worked for smaller, independent, niche insurance brokers and is now Head of Estates and Private Clients at James Hallam. Marcus' special insurance interests include covering major art collections and historic houses. He is also developing a wider protection offering to high and ultra-high net worth private clients by working with other professionals who provide non insurance related advice and services. This is driven by a belief that such clients are looking for wide ranging, interlocking protection from a range of professionals who work together to provide a seamless solution to a variety of risks that might threaten them. Outside work, Marcus maintains an interest in architecture, music, mountain biking and fine wines. Steve’s broking career began at Sedgwicks where he placed International Property and Construction risk in the Lloyds and Company markets. He went on to build a strong reputation in the Private Client and Fine Arts market where he broked for historic houses, art and antiques dealers, private and corporate art collections and Fine Art Auctioneers. Taking this wealth of experience, Steve formed Smith Ross Shane & Company Limited in 1996, to create a successful and well respected private client and corporate brokerage business. In 2007 Smith merged the business with that of Giles Greenfield, to form Smith Greenfield Services Plc. The business continues to flourish under Smith who has overseen significant investment in developing new High Net Worth insurance solutions and staff development together with launching the highly successful ‘Confidas’ brand providing Mid and High Net Worth Portfolio propositions for brokers.